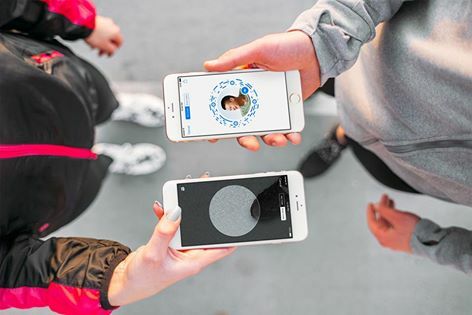 A day after people started noticing Facebook was now suggesting business to chat with while in Messenger, the social network officially announced a suite of tools and updates designed to help Facebook users better connect with the businesses using its platform. As part of these changes, businesses will now see their Facebook Page usernames being more heavily promoted across the site, and they’ve been given two new ways for people to begin chatting with them: Messenger Links, which are short URLs, and scannable Messenger Codes. 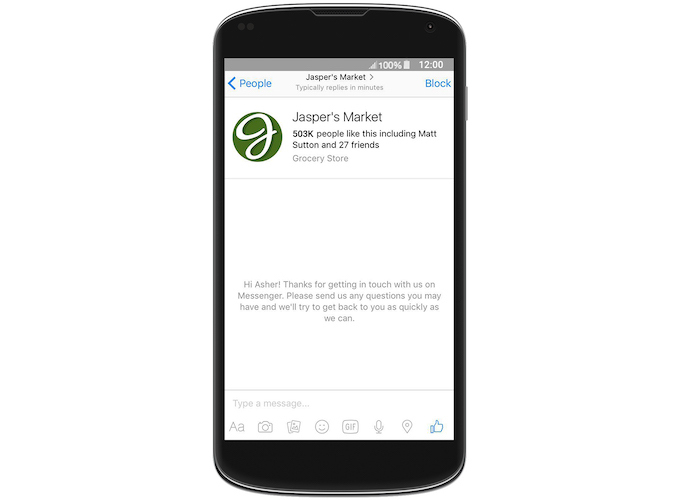 Like Facebook users, some Facebook Pages also have vanity URLs, Facebook explains, such as facebook.com/JaspersMarket. Those that have a vanity URL already have a username – it’s the part of that URL after the slash (e.g. @JaspersMarket). Going forward, these usernames will be placed directly on a business’s Facebook Page, directly underneath the Page title with the @ symbol in front of it. Those Pages who don’t have a unique username will want to create one, and of course those who haven’t paid much attention to their vanity URL before may want to make some changes before this feature goes live. Given that this feature will now tie into Facebook’s larger plans around connecting customers to businesses, it will be critical for Page owners to snag the username they want to represent them on the network. That could trigger a “land rush” of sorts for some of the more common names that haven’t already been snatched up by way of a business staking a claim on a vanity URL. Along with this announcement, Facebook also debuted Messenger Links and Codes, which will help customers more easily start conversations with businesses by way of Facebook’s Messenger service. Messenger Links are basically short, memorable URLs that take advantage of the Page’s username combined with Facebook’s own URL shortener. These will be in the format “m.me/username,” and when clicked, they will immediately open up a chat with the business in question in Messenger. TechCrunch earlier this year reported that short links were in the works. Similarly, Messenger Codes will serve the same purpose of opening up chats, but are instead unique codes that people can scan in Messenger using the camera on their phones. Scanning codes is something that Snapchat has popularized as a means of adding friends to its competing networking app, so it’s interesting to see Facebook also now taking a step in this direction as well. However, in this case, the codes are aimed at Facebook’s business customers. The codes can also be used in ads, websites and other marketing materials, Facebook says. 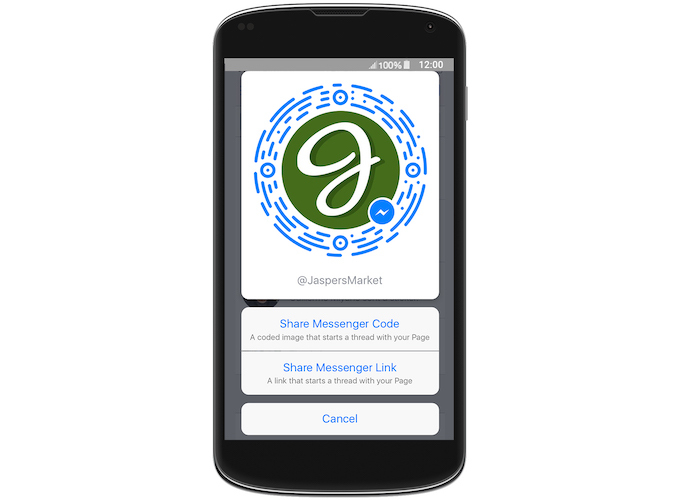 These Messenger Code images for download are being delivered via the Page’s inbox. That being said, scannable codes and short links aren’t being limited to businesses – Facebook more quietly announced today that people – meaning users – will have access to this feature too. That’s a logical next step – after all, once the product has been developed, it wouldn’t make sense to limit its use to businesses. However, it seems that the bigger focus for now is getting Pages on board. This extra tidbit was unveiled by way of a Facebook post by Messenger head David Marcus, who said that both businesses and “people” will have usernames, links, and codes. (This isn’t the first time Facebook used QR codes, however – it previously used them in its failed anonymous app Rooms, which used a QR-code invite system). Messenger, Marcus also noted in his post, now has over 900 million monthly active users, and over 1 billion messages are sent between people and businesses each month. Finally, Facebook said it will soon allow businesses to customize their “Messenger Greetings,” which is a new feature that pops up a note in the message thread between a business and customer before any messages are sent. The idea here is that businesses can set the tone or pass along important information to those who are reaching out to chat. This isn’t the first time Facebook has offered a way for businesses to customize, save, then automate their communications with customers, we should point out. Last year, it rolled out a tool called “Saved Replies,” which let Pages respond to customers using Canned Messages, for example. Facebook today didn’t address the “Suggested Businesses” section appearing for some users in Messenger, which indicates that either that feature is not live for all, or is still just a test. However, what is clear is that Facebook is intent on helping Pages and businesses make the transition from the larger social network to the Messenger chat service. This push comes at a time when more users are shifting over to private messaging apps to socialize and spend time on their phones. Not all businesses on Facebook have made Messenger or chatting with customers a priority, instead focusing on maintaining and updating their Pages. With the new tools, rolling out in the “coming weeks,” Facebook is giving those businesses a heads up that mobile messaging can no longer be ignored.